Kansas University junior Jordan Scott clears 5.4 meters (17-feet, 81/2 inches) to capture the NCAA Outdoor pole vault championship. 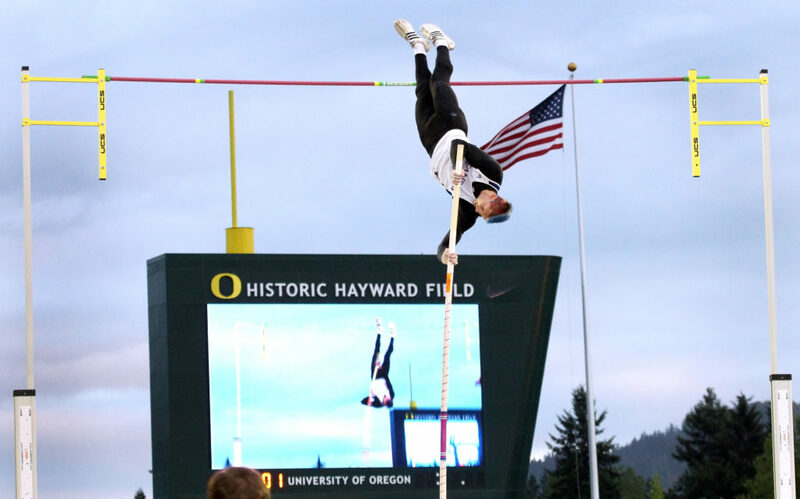 Scott became KU’s second pole vault national outdoor champion on June 10 in Eugene, Ore.
A funny thing happened when Jordan Scott dropped by the Kansas University athletic-department offices the other day. Kansas junior Jordan Scott pole vaulted his way to a NCAA title on Thursday in Eugene, Ore.
Scott, Kansas University’s junior pole vaulter, just popped in to get his workouts for the coming week and was stunned at all the “attaboys” tossed his way. Funny how an NCAA title can get a guy noticed. On June 10 in Eugene, Ore., Scott cleared 5.4 meters (17-feet, 81?2 inches) and became the Jayhawks’ first NCAA Outdoor titlist since Leo Bookman in 2003. He became KU’s second-ever pole vault national outdoor champion, joining 1970 winner Jan Johnson. It was Scott’s third All-America honor but first outdoors. He did, but not before overcoming some of the most trying conditions he ever had experienced as a vaulter. Competitors battled a cold headwind during warmups. There was a bar snafu that negated all previous vaults at a certain height. Though Scott hadn’t yet begun to compete, it did delay his start. And there was a rain delay after Scott easily cleared his opening height. In all, the ordeal dragged out nearly five hours. If shrugging off the weather was a matter of conditioning, overcoming the other distractions was by design. It was all in his head. That’s what’s going on inside his head. So what about what’s going on on top of it? Scott is known for sporting motley ‘dos at competitions. In Eugene, his locks were crimson and blue. 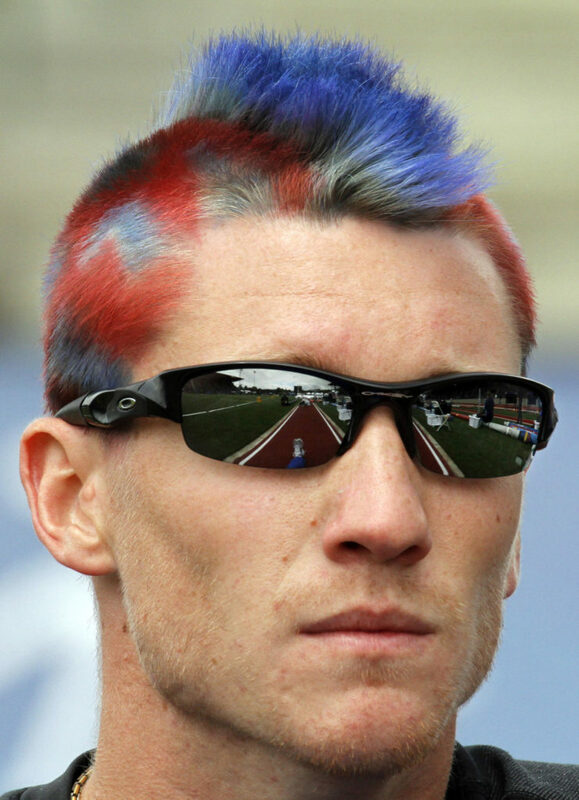 His favorite, he said, was his Kansas Relays ‘do: red and blue with a pink ribbon shape in back. For the record, Scott is no cosmetologist. He enlists the aid of female friends/fellow vaulters on the Arkansas team. The dye jobs aren’t merely cosmetic. Scott figures if he does his hair up physically, he lets it down literally. It’s suggested that, among track-and-field athletes, the vaulters frequently are the most, uh, flamboyant. Scott isn’t about to disagree. Scott red-shirted last outdoor season and won’t compete again until next outdoor season. Given the Jayhawks’ performance at the NCAAs — thanks to his vault victory and freshman Mason Finley’s pair of runner-up finishes in the shot put and discus, KU placed seventh as a team, its highest team finish since 1975 — Scott can’t wait to return.